Do you own one of those RFID-blocking wallets to keep your credit cards from being read unawares? If so, you are engaging in electronic countermeasures. 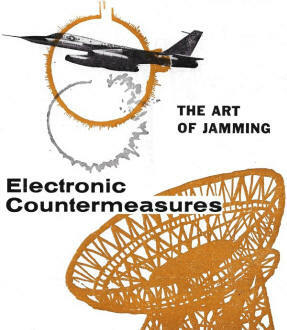 Anyone interested in the history of electronic countermeasures (ECM) and electronic counter-countermeasures (ECCM) will benefit from this 1959 Electronics World article. ECM has been practiced as early as World War I when wireless communications was first used for military purposes. ECCM, of course, followed immediately on its heels. Electronic countermeasures range from simple jamming of receivers to emitting spoofing signals that fool receivers. In extreme cases ECM can destroy receiver front-ends by overdriving and burning out circuitry. ECM and ECCM has always been and always will be a sort of cat-and-mouse game, the pursuer being the pursued. The same scenario plays itself out daily in the realm of computer security, corporate and military espionage, and law enforcement. Today, in the age of target-seeking missiles, radar and radar countermeasures are even more sophisticated than ever before. Here are some methods that have been and are being employed. Electronic countermeasures (ECM), the art of jamming or deceiving an enemy's radio and radar, is both old and new. At the very beginning of World War I, the Germans jammed British radio communications to cover the escape of their warships Goeben and Breslaw to Turkish waters. In the cause of ECM the World War II allies broadcast Nazi propaganda, distributed Christmas decorations to the German populace, and flew jamming planes over Tokyo. Countermeasures saved 450 U. S. bombers and 4500 American airmen from destruction by radar-controlled German flak, and turned back Japanese torpedo plane attacks in the battle for Leyte Gulf. Today, in the age of target-seeking missiles, both radar and radar countermeasures are more sophisticated than ever. The World War II struggles for scientific supremacy involving the then little-known countermeasures devices was called the "Wizard War" by Sir Winston Churchill, and England needed this "wizardry" during the Battle of Britain to save London and her other cities from chaos and total ruin. 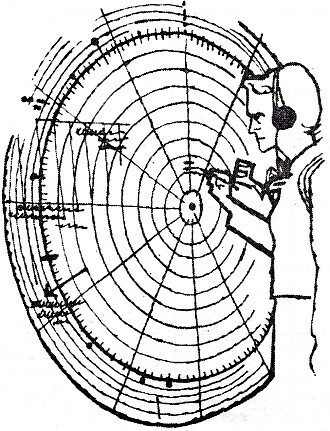 Initially, German bombers were navigated by the use of radio beacons. A large number of these beacons, each with its own characteristic transmission, were set up at various points on the continent so that the German navigators could use radio direction finders to fix their positions by the bearings of any two stations. The British countered this scheme by picking up the German signals and rebroadcasting them from England. The false bearings led the German navigators astray and a number of planes were lost in this way. One German bomber actually landed in southwestern England under the impression that it was in France. At the end of August 1940, however, the Luftwaffe came up with a scheme whereby their bombers flew along a narrow radio beam which was crossed by a second beam over the intended target. The British had anticipated this plan before it was put into effect and were ready for it. They picked up the beam, carried it over telephone lines for a few miles, and rebroadcast it at a stronger level in a direction which intersected the original beam at a slight angle. This deflection of the beam was not perceptible to the bomber pilot and it placed him far off the target with his bombs. German air crews wandered around England bombing open fields for several months before they realized that their navigation beams were being juggled. The Germans then tried to disguise their beams. They would cover England with a propaganda broadcast and then narrow its coverage to a thin beam over the intended target. British intelligence soon noted that, in a target area, radios tuned to the propaganda broadcast suddenly grew louder just before an air raid, while radios elsewhere lost their volume. They therefore picked up the Nazi propaganda broadcasts and retransmitted them from omni-directional antennas, making them useless for navigation. The effective use of these and other countermeasures so disrupted the German bombing systems that only one bomb in five fell within a target area. This 80 percent reduction in the enemy efficiency was a great victory for the British at a time when all other means of defense had failed or were strained to their limits. In the fall of 1940 the Germans switched to night bombing in an attempt to reduce their aircraft losses, but the British soon had radar-equipped night fighters in the sky. Partly because their beams provided information on the direction and timing of raids, the Germans lost too many bombers to maintain the aerial blitzkrieg. In May of 1941 the German Air Force broke off the attack on Great Britain, and turned for action to other theaters. As the Luftwaffe bombers faded from the skies, RAF night raids on the invasion coast and "Festung Europa" grew in intensity. To locate the British bombers from the air, the Nazis began in 1942 to install the 500-megacycle Lichtenstein airborne radars in their night fighters. The success of this equipment, nicknamed "Emil-Emil" by the German pilots, demanded development of a countermeasure. Jamming by a transmitter carried in the bombers was not feasible because the jammer itself would serve as a beacon. It was decided, therefore, to locate a tremendously powerful ground-based jammer on the English coast pointed toward France to blot out the screens of the German night fighters as they chased the homeward-bound bombers. The U. S. was asked to furnish this transmitter under lend-lease and work was begun on the "Tuba" jammer in 1943. It used a powerful resnatron u.h.f. oscillator which generated 50 kilowatts c.w. 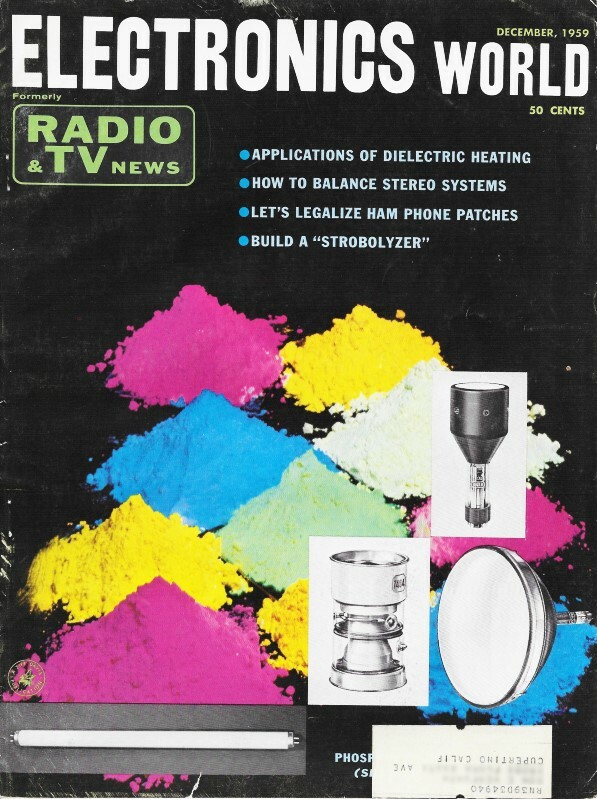 at any frequency between 350 and 650 megacycles, with noise modulation. The waveguide output led into a horn radiator made of chicken wire, 150 feet long and having a 6- by 18-foot opening. Tuba went into tactical operation early in 1944 and was used to blanket the sky above the Normandy invasion. As the allies gained aerial supremacy over Europe and the problem of German fighter plane opposition diminished, the Germans built up formidable anti-aircraft installations which used from 4 to 16 guns operating with a Wurzburg fire-control radar system. 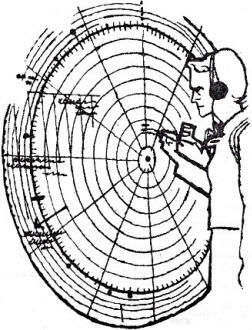 (At the time of World War II, the Germans called radar "Funkortgerät," or "Funkpeilgerät," or even "Funkmesstechnik mit Impuls-modulation". They now call it "radar".) Over 4000 Wurzburg radar batteries were put into service to defend important targets and their accurate fire produced heavy losses among attacking bombers. The air forces turned to countermeasures to furnish a "magic carpet" on which the bombers could safely fly over the German flak. In the summer of 1943, "Carpet" jammers were installed in the aircraft of two 8th Air Force bomber groups. Each jammer radiated six watts of noise-modulated c.w. in a 7-megacycle band. The center frequency could be tuned over a wide range around the 560-megacycle nominal operating frequency of the Wurzburgs. Because the Wurzburg antenna used a spinning dipole, the jamming signal had to be circularly polarized. This polarization was accomplished with a "Fishhook" antenna using two stubby dipoles at right angles. The two bomber groups initially equipped with Carpet jammers sustained less than half the losses of non-equipped groups. Therefore, the entire 8th Air Force was equipped with these electronic jammers. The Germans tried to escape the jamming by staggering the frequencies of their radar units but the allies began dropping strips of aluminum foil to produce false echoes on the enemy radar screen. Known as "window" by the British and "chaff" by the Americans, these aluminum strips were dropped by the millions; more than 20,000 tons were dispersed over the German countryside. (The German citizenry gathered this tinsel for Christmas tree decorations.) To be efficient reflectors, the strips had to be close to a half wavelength long, so a range of lengths was distributed. On a radar screen, an aircraft throwing out chaff seemed to multiply into a whole swarm of targets which stayed behind as the plane flew off. Succeeding aircraft were then hidden from the radar as they flew through the slowly falling cloud of foil. Planes outside the cloud were not hidden, but the material fell so slowly (150 ft./min.) that the area over a target could be cluttered for hours, rendering radar gun directors useless. To achieve radar vision in a chaff cloud the Germans developed radar circuits which would distinguish between moving and stationary targets, but these circuits were all the more susceptible to the Carpet jamming. Conversely, the use of anti-Carpet devices made the radars more vulnerable to chaff. Thus, the combination of electronic jamming and confusion reflectors produced effective protection against anti-aircraft fire. The Germans found that while 3000 rounds were fired to bring down a bomber protected by ECM, less than 800 rounds were required per kill in the absence of jamming. Thus, the effectiveness of the radar-controlled anti-aircraft defenses was reduced by 75 percent. Since 150 bombers were lost to such anti-aircraft fire, it can be estimated that ECM saved 450 planes and 4500 men in Europe. As the time for the invasion of Europe approached, the impressive radar coastal defense of the Germans became a major topic at planning conferences. At least 50 radar installations, each having at least two radars - early warning and gun laying - were known to exist between Dieppe and the tip of the Cherbourg peninsula. These sets were adapted to supplement or replace each other and were diversified. For example, the early warning Freyas, which had all operated within 8 megacycles of one another at the beginning of the war, were now dispersed over a band about 100 megacycles wide. It was necessary to put these radars out of effective operation in order to prevent the enemy from finding out where our forces were concentrated. This purpose was accomplished by deception and by jamming as well as by bombing and strafing attacks on the radar installations. On the night before "D-Day," airplanes carrying jammers cruised up and down the south coast of England jamming the German early warning radars to prevent them from seeing our air squadrons forming over England and approaching the continent. Groups of small craft, equipped with huge reflectors and towing aluminum-painted balloons to make their radar echoes look like those of a major warship, approached the French coast at numerous widely separated points. Chaff was dropped over these groups to give them the radar aspect of vast convoys. A small force of bombers using jamming and chaff simulated a heavy raid headed into Germany; this succeeded in drawing a number of Nazi night fighters off to the east of the invasion forces. The Germans later attributed much of the success of the invasion to this confusion which prevented them from meeting the launching forces with all the reserves at their disposal. In the Pacific war, the tremendous distances which our planes and ships had to traverse to strike at the enemy made radar (the Japanese name for radar was "dempa tanchiki" - electric search) defenses extremely important to the Japanese and made countermeasures vital to the U. S. forces. Far-ranging aircraft and submarines, equipped with search receivers, pinpointed Nipponese radar installations from the Solomons to the China coast. Up-to-date maps showing the areas covered by these enemy installations were maintained for use in operational planning. Enemy radar installations were often put out of action by strafing and bombing planes known as "radar busters" which were outfitted to "home" on the radar signals. The enemy operators soon grew chary of having their own radars used as beacons and would cease transmitting when planes flew too close to them. When the Pacific Air Forces began to bomb the Japanese home islands, they encountered effective searchlight-control and anti-aircraft fire-control radars. To counter these radars, both electronic jamming and confusion reflectors were used, just as in Europe. Instead of chaff, however, 400-foot aluminum foil ribbons were dropped suspended from parachutes. This type of confusion reflector, called "rope", was such an effective countermeasure against the low-frequency radar used by the Japanese that each Superfort carried 600 pounds of "rope" on each mission. In addition, every plane was equipped with at least one jamming transmitter. During daylight raids, when the bombers flew in massed formations, these jammers complemented one another and safely protected the entire flight. At night, however, the B-29's flew in long streams a mile behind one another. To screen each bomber from all the radars which might be encountered, a few special jamming aircraft carrying many jammers and search receivers flew over the target area parallel to and above the main bomber force. These "Porcupines" - so named because they bristled with antennas - were effective because the low frequency of the Japanese radars made their radiation and reception patterns broad and easy to fill. In the Navy, ECM was a fleet-wide activity. Every ship from destroyers on up carried intercept and jamming equipment, and even landing craft carried jammers which were preset before amphibious operations to protect them from radar-controlled shore batteries. Some vessels also carried transmitters for deflecting German radio-controlled glider bombs. Shipboard jammers were employed with conspicuous success against Japanese torpedo bombers using radar sights during the battle of Leyte Gulf. When jamming was turned on, the attackers were observed on the radar scope to waver from their course and finally turn back. Naval ECM was decisive in the classic night action of the war when, in October 1944, a Japanese battleship force tried to pass through Surigao Straits to attack troop transports in Leyte Gulf. Five American battleships blinded the Japanese radar by jamming and then used their own radar-controlled gunfire to sink the enemy. Communication Countermeasures While jamming and deceiving enemy radar and navigation systems was an important phase of ECM in World War II, countermeasures against communications were also of vital importance. Aircraft and Army field radio circuits were monitored and jammed. One outstanding example occurred during the Libyan Desert campaign when the British aircraft radios jammed German v.h.f. tank radio sets: the pilots simply placed their microphones close to the airplane engine and broadcast its noise into the German tank radio receivers. On other occasions German-speaking Americans would break in on Nazi fighter-control radio circuits, giving contradictory orders and urging the pilots to ignore the other (real) instructions. When the Germans switched to female voices, German-speaking WAC's were ready to mimic them. The results were so disruptive that the Germans used a score of voice circuits simultaneously to insure reliable communication with their planes. The "Cigarette" Signal Corps project for jamming enemy air-to-ground radio also figured extensively in the early defense against the V-2 rocket. The missiles radioed back height and speed data; at the right moment, as determined from this data, the Germans would turn off the rocket motor by radio and let the missile coast to its target. To deflect the missiles, false signals were sent from England to the V-2's, shutting off their power too soon so that they fell short. This countermeasure was so successful that the Germans gave up radio control and switched to gyro control, which we could not jam. The development of countermeasures systems has continued since the end of World War II to a point where this year the United States is spending over 400 million dollars on ECM - more than the total spent during World War II. Reflecting the state of offensive weapon development, most of the countermeasures are for airborne application. Bombers are defended from radar-controlled interceptors by use of ECM rather than by guns. Complete countermeasure system packages have been developed for the Air Force B-52 and B-58 bombers. One of these planes in each formation carries an ECM pod in place of a bomb load, providing electronic defense for the entire group. Radar-guided missiles and interceptors continually measure the range and direction of their targets and feed this information to their guidance systems. If the radar can be induced, by ECM, to give false guidance information, the target is protected. Range data can be obscured by use of a small electronic countermeasure transmitter which sends out a series of pulses at suitably spaced intervals each time that a pulse arrives from the enemy radar. A number of false targets are thus created, each at a different range. If the ECM pulses have the same length, frequency, and pulse repetition rate as the enemy radar, they cannot be distinguished from actual target echoes. If the false echoes are sufficiently stronger than the true one, the actual target may not even be detected. Another countermeasure which provides false range information is the technique of "range pull-off". Pulses sent out by the ECM transmitter are slowly shifted in timing, relative to the arrival of the enemy's pulses, thus simulating a change in target range. It is more difficult to obscure the direction of the target than its range. One way of providing false directional information depends upon the presence of side lobes in the pickup pattern of the radar receiving antenna. The ECM transmitter is turned off while the target is in the main beam, but sends out strong spurious pulses when it is in one or more of the side lobes. This creates false targets on the radar scope, with different bearings from the true target position by several degrees. Another way to confuse the enemy as to target bearing is to rotate a directional reflector on the target thus producing an amplitude modulation of the returned radar echo. This modulated echo is particularly effective in misleading a radar that uses conical beam-scanning to determine the direction of a target. The launching of decoy missiles is a useful form of defense against a radar-guided interceptor. The decoy is equipped with a device (corner reflector or Luneberg lens) to make it return a very strong radar echo; this strong echo can fool the attacker into following the decoy instead of the bomber. Similarly, decoys can be used against infrared missiles. Having considered the countermeasures activity being pursued today, it is natural to conclude with a look at counter-countermeasures. Since most countermeasure devices must be tuned to the operating frequency of the radar which they seek to counter, the counter-countermeasure is to design radio or radar systems which can change their operating frequency quickly. The DEW Line, for example, has such provisions. To counter the spurious-pulse countermeasure systems, the radar may vary pulse length or repetition rate or use a modulation of the pulse to give it an identifiable characteristic. Continuing advances in electronic techniques and devices daily increase the potentialities of electronic warfare, but simultaneously provide new scope for ingenuity in ECM. It is clear that the improved communications and detection systems of tomorrow will have their counterparts in improved countermeasures.